The Golden Age of Flying, and especially the lives of female flyers has intrigued me ever since I read Laurie Notaro’s fantastic Crossing the Horizon. The golden age of the ’20s and ’30s was characterized by a huge upswing in popularity for flight, an increasing availability of aircraft, and the very real danger of disaster from less-than-reliable machines. This was a time of new records to set and to break, exploration and pushing limits. Of trans-continental races, and no-holds-barred competitions. It was a time when a man or woman with enough gumption, talent, and luck could set their name in the history books as a first, or fastest, or farthest. O’Brien’s book features five outstanding female pilots. Big names and big stories in their day, but only one (Earhart) is still remembered today, ironically for her presumed death, and not as much for her accomplishments in flying. This is a fascinating story, in a fascinating time in aviation. O’Brien has captured the glamor and the drama of his subjects. We get to go along with them as they try to break into an arena that was (and largely still is) considered to be men’s territory. You will laugh and cheer, gasp and shudder, you will shake your head and your fist. O’Brien has done a fantastic job at bringing these exceptional women back to life. This book read like a combination of fevered nightmare and fairytale. And I mean that in the best way possible. The story takes our heroine (? ), known only as “Goody” and sets her down in a wood where magic weaves into the bark of the trees, and the stench of rot can be sensed when the wind blows the right way. Like a traditional fairy tale, the story begins by showing us the fantastical…the sharp teeth are well hidden. But as the story goes on, the underlying menace comes to the fore, and the smile widens into a razor grin. This isn’t your traditional horror story … but the dream-like prose and ever-fascinating subject matter make this book shine. Anyone out there looking for something a bit different for the Halloween season and the dying of the year should consider this book. In the winter trenches and flak-filled skies of World War I, soldiers and pilots alike might avoid death, only to find themselves imprisoned in Germany’s archipelago of POW camps, often in abominable conditions. The most infamous was Holzminden, a land-locked Alcatraz of sorts that housed the most troublesome, escape-prone prisoners. Its commandant was a boorish, hate-filled tyrant named Karl Niemeyer who swore that none should ever leave. Desperate to break out of “Hellminden” and return to the fight, a group of Allied prisoners led by ace pilot (and former Army sapper) David Gray hatch an elaborate escape plan. Their plot demands a risky feat of engineering as well as a bevy of disguises, forged documents, fake walls, and steely resolve. Once beyond the watch towers and round-the-clock patrols, Gray and almost a dozen of his half-starved fellow prisoners must then make a heroic 150 mile dash through enemy-occupied territory towards free Holland. Drawing on never-before-seen memoirs and letters, Neal Bascomb brings this narrative to cinematic life, amid the twilight of the British Empire and the darkest, most savage hours of the fight against Germany. At turns tragic, funny, inspirational, and nail-biting suspenseful, this is the little-known story of the biggest POW breakout of the Great War. So have you seen The Great Escape? The 1963 film is a virtual who’s-who of ’60s movie stardom (including Steve McQueen (yay! ), James Coburn, Richard Attenborough, and James Garner). The movie is a dramatization of a real-life mass prison break from a Nazi prison camp during World War II. The Escape Artists tells the story of the men who laid the foundations of such escapes. World War I brought warfare into a brutal, modern era. The trenches, the gas, the aerial dogfights were new and terrible realities of battle. In addition, the imprisonment of enemy soldiers occurred at a rate previously unheard of. The systems surrounding these mass incarcerations, and the rules of engagement between prisoner and jailer were new and largely untested. It was drilled into British soldiers and officers that their duty, if captures, was to escape and rejoin the fighting force as soon as possible. Beyond bringing experienced fight men back into the fold, even unsuccessful escape attempts diverted critical enemy resources from the front lines. Bascomb has given us a lively, riveting history of some truly remarkable men. The sheer ingenuity of their escape attempts (which were many) is something to behold. These men displayed bravery under pressure, creativity in the face of hardship, and an unflagging determination to escape from their captors. When WWII began, the most successful of these escape artists would go on to tutor a whole new generation of soldiers in the art of prison break. This is a history book for military buffs, but also for anyone who enjoys a good adventure story. The fact that all this really happened only makes it that much more enthralling. An advance copy of this book was provided by the publisher via Goodreads Giveaways in exchange for an honest review. This is the story of a small packet sailing ship, the John Rutledge, which set off across the Atlantic from Liverpool to New York in the winter of 1856. The ship, carrying cargo and Irish emigrants, struck an iceberg in the north Atlantic, and only one soul would live to tell the tale. There are quite a few best-selling narrative non-fiction books about famous shipwrecks, such as Erik Larson’s Dead Wake, Nathaniel Philbrick’s Heart of the Sea, and numerous books about the sinking of the Titanic. These ships have become legend, and the stories have a great deal of primary information and research behind them. In Adrift, Murphy has given us a smaller tragedy. The sinking of the John Rutledge is one of many tragic stories lost on the shoals of history, and the careful research needed to bring it back into the light should be commended. Murphy has delved into private journals, newspaper clippings, family lore, and shipping records. What is more, he has compiled this information into a gripping, narrative story. Fans of narrative nonfiction and tales of maritime derring-do will find a lot to admire in Murphy’s careful research and close attention to detail. History buffs cannot help but rejoice when another largely unknown story is pulled from the depths of the historical record. Isabel Bilton is the oldest daughter of a military family in the late 1800s. Even as a young girl, Isabel dreams of moving beyond her family’s bland, middle-class roots and becoming someone glamorous, someone important. A gifted singer and dancer, Isabel moves to London where she restyles herself as Belle Bilton and proceeds to take London by storm. Catching the eye of a young count, Belle finds herself marrying into the country’s social elite, but the peers of Britain want nothing to do with this upstart “peasant countess,” and Belle finds herself kn a fight for everything she holds dear. This is a fictionalized account of a real woman. Belle Bilton was a woman ahead of her time. She was independent minded and self assured, yet always struggling to find her place in society. She wanted to be cherished, loved, and admired, but didn’t want to that the societally acceptable routes to get there. O’Connor brings this fascinating woman to life in a well-researched, vividly written account. Fans of historical fiction, and real-life stories of women successfully footing Victorian convention should look no further. This is the second book in the Madeleine Karno series, so there will likely be spoilers in this review for the first book in the series. Or, if you’re like me and didn’t read the first book, Lady in Shadows is enjoyable as a standalone. In 1894, the president of France was assassinated. In the wake of the riots and unrest that followed, the body of a young woman was discovered on the streets of Varbroug brutally mutilated in a fashion reminiscent of the Jack the Ripper murders which plagues London only a few years before. Madeleine Karno is struggling to continue her work as a female pathologist in a very male world. She has been accepted as the first female student at the University of Varbroug, but as a physiologist, not a medical student. With the brutal murder causing greater and greater amounts of sensation in the press and panic in the populace, Madeleine finds the investigation focused more on the victim’s status as a prostitute rather than who may have killed her. Determined to see justice done, Madeleine finds herself traveling farther and farther into the city’s dark secrets, and closer to a brutal killer. This was a great historical mystery. The tone is dark where most entries in this genre tend towards the cozy. Madeleine Karno makes for a great protagonist. She is smart and driven, but not Wonder Woman. She makes mistakes, she falls into self doubt, and her struggles to reconcile her ambitions with her femininity seem very real and very relatable. This is no dilettante society dame dabbling in murder, or the ice queen career harpy we see so often. Rather, Karno knows she has brains and wants to use them, but is also trying to figure out how to balance her engagement to a German professor, the demands of running a household and (shudder) the possibility of children with realizing her goals of becoming a pathologist in her own right. This is a struggle that nearly every employed wo,an will recognize. Those who enjoy period mysteries, especially featuring a strong and relatable female lead, should check this series out. An audio book copy of this book was provided by the publisher in exchange for an honest review. This is a love story to a once-great city, told by a native son. Maraniss here chooses to focus his attention to 1962-1963, banner years for auto capital Detroit. Ford was on top of its game and looking to revolutionize the American sports car with the Mustang; Motown was hot and setting off a string of number one hits by artists who would become legends; the struggles of the civil rights movement were bolstered by a forward-looking local government and strong black community. Everything seemed poised to keep Detroit on top for decades to come. Of course, today we know the realities of its current incarnation. But Maraniss here delivers us a loving, lingering look at a city that was a beacon for many across the country. Maraniss’ tales weaves in and out of politics, industry, music, religion, civil rights, law and order, and crime, we see how the biggest and smallest players of Detroit lived their intermingled lives, how small connections and deep alliances helped to shape the city of Detroit. This book is all the more fascinating considering the depth of the city’s fall from grace. Seeing such a vivid portrait of the city in its heyday makes it all the more obvious what has been lost. This book is great for both history buffs and for those interested in current events. There is quite a bit in this book which echoes modern day issues and struggles. This book makes you want to root for Detroit, to hope that it’s future could hold even a fraction of the vivacity of its past. A copy of this book was provided by the publisher via Goodreads Giveaways in exchange for an honest review. At the turn of the twentieth century, Kitty O’Kane grows up poor in the slums of Dublin, Ireland, enduring beatings from her drunken father and dreaming of a better life. She gets herself out of her old life and into service with the prestigious White Star line. She is able to secure a position as a stewardess on the line’s newest and largest ship: the Titanic. And so starts the saga of the Unkillable Kitty O’Kane. After becoming romantically involved with a firebrand journalist, Kitty dives into the fight for the poor, the disenfranchised, and for women’s sufferage. She bears witness to the some of the most calamitous and tumultuos events of the early twentieth century. Through Kitty’s eyes we experience the sinking of the Lusitania, the Russian Revolution, and the start of The Troubles in Ireland. Kitty spends much of the book lamending her past. She ties herself early on to the increasingly erratic reporter, and pines for Tom Doyle, a young boy from her childhood in Dublin who has since grown into a handsome young doctor in London. And this is the crux of the problem for the book. Romance and love triangles are all well and good, but Kitty’s relationship with the men in her life completely takes over any true agency she might have had. Yes, she witnesses the October Revolution in Russia, but she is only there because the journalist, Lincoln, has dragged her there. She wants to be a journalist herself, but lacks the courage to write in her own words, and rather follows Lincoln’s lead in all her writing. She eschews becoming a wife and mother in favor of adventure and activist (a decision I applaud) yet will not picture a life with her “true love” Tom Doyle that does not adhere to traditional relationships. She may be The Unkillable Kitty O’Kane, survivor of two shipwrecks, Russian snipers, and British armaments, but she is only that by accident, or by someone else’s agency. She is on a quest to better the lives of women in the world, but the author doesn’t let her make an attempt except by the side of a man. So, the historical aspects of this book were lovely, and Kitty’s insertion into actual historical events, and her meeting with real historical people is well done. But I found Kitty’s lack of agency, and her dependence on an increasingly erratic Lincoln to be frustrating, and runs counter to the plot of a book that emphasized the personal strength and growth of a woman born with nothing who makes something of herself. The Andes mountain range in South America runs down the west coast of the continent. The stories and histories of the place are as varied as the peaks themselves. 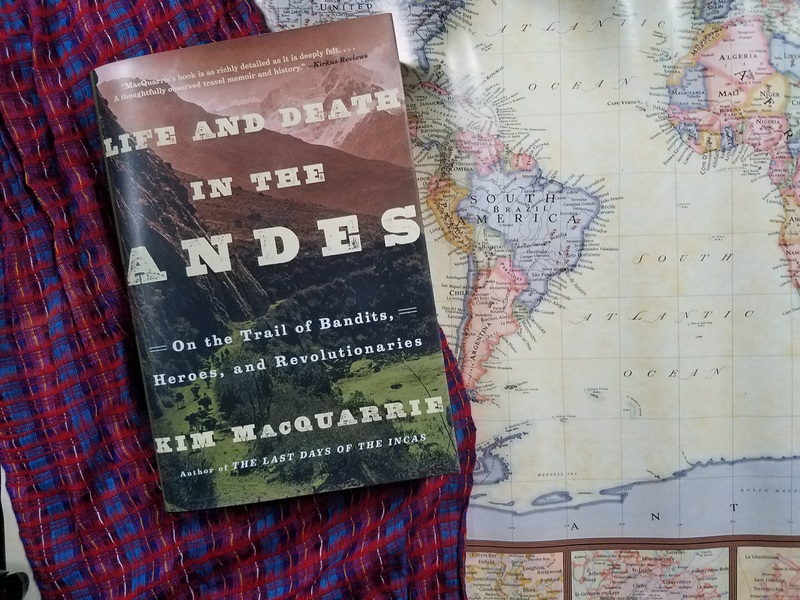 In Life and Death in the Andes, Kim McQuarrie gives us a travelogue and a history book, a sweeping epic and an intimate portrait. From the cities of Columbia to southernmost Chile and Argentina, McQuarrie brings us stories of druglords and mummies, weavers and bandits, natives and revolutionaries. Mixing history seamlessly with his own travels, Life and Death in the Andes gives us a unique perspective of life in the Andes mountains. History buffs, world travelers, and the curious will find a lot to like in McQuarrie’s easy conversational style. Anyone who wants to go a bit off the beaten trail will enjoy the stories McQuarrie has to tell us. “Heroic medicine” is well named. Prior to the advent of anesthetics, patients were awake and aware for surgical procedures. The pain and horror of feeling a surgeon cutting into your body is something we now associate with a nightmare. Going through asurgery was nearly as likely to kill you as not receiving treatment at all. With the discovery of ether, surgeons no longer had to restrict their operations to procedures which could be completed in minutes. With the field of surgery becoming ever more ambitious, post-surgical infections became the chief danger to patients. In a time before germ theory was accepted, opinions and practices used to treat or prevent infections (laudable pus, anyone?) varied widely, and with little success. In the 1860s, Quaker surgeon Joseph Lister set about trying to determine scientifically the causes of post-surgical infections, and how to best prevent these deadly conditions. Lindsey Fitzharris gives us a great view of Victorian medical practice, and of the scientific and medical theories and traditions that made the prevention of nosocomial (hospital-induced) infections so difficult. 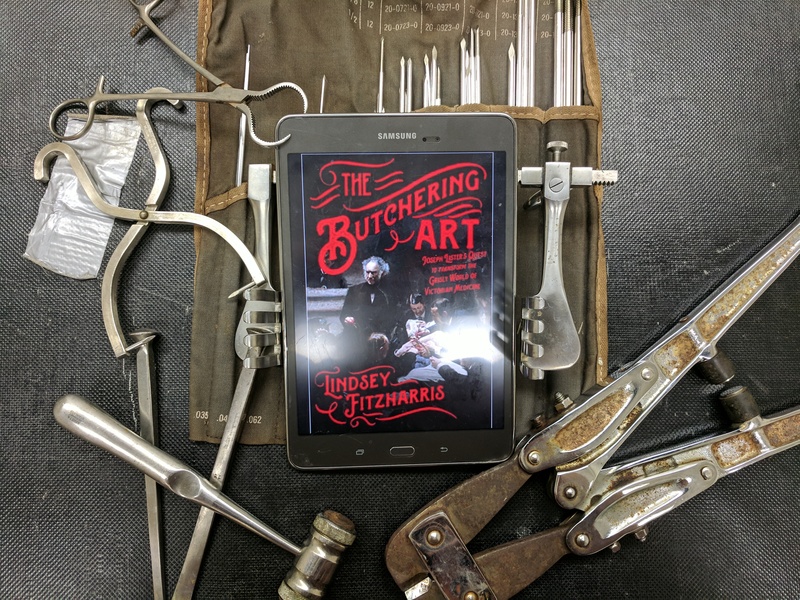 The Butchering Art is both a history and a biography. The book earns a place next to The Knife Man by Wendy Moore (about contemporaneous surgeon John Hunter) and The Ghost Map by Stephen Johnson (about Dr. John Snow, who helped trace a cholera outbreak in London to a single water pump). Any history buff interested in the history of medicine will enjoy this book. 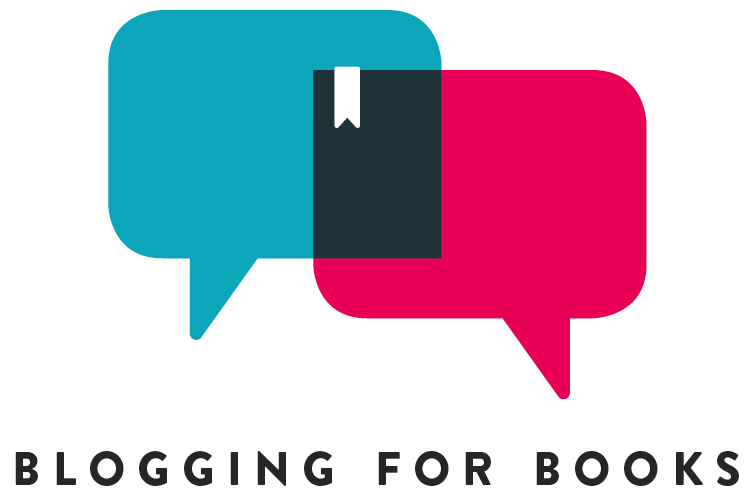 More casual readers will likely also find this book to be entertaining and accessible. Beware though, Fitzharris provides several very accurate and vivid descriptions of Victorian-era surgeries, so the book is decidedly not for the faint of heart.